It's not "Just Glass"......It's Sea Glass! It can take 7-10 years in a constant surf environment for sea glass to "become" sea glass. 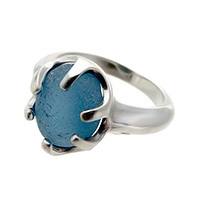 A quality piece of sea glass has no shiny spots, is well frosted and has smooth tactile edges. See Our Valuing Page for more Info on sea glass quality. PLEASE NOTE the tag lines "Worn by waves, recycled by the sea, sea glass is a product of both nature and man." and Sea Glass is reverse gem"© as well as this entire page are protected under the Digital Millennium Copyright Act (DMCA) and use of this content are prohibited by law. 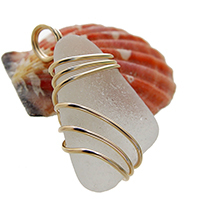 AND..................If you have a special piece of sea glass that you would like us to turn into jewelry, please visit our Custom Order Page for more Info! We can make jewelry using your sea glass or ours and we offer just about every color in the world from the most common to the rarest sea glass pieces ever found! These diminishing beach gems are becoming harder to find as glass is no longer used as it was in the past. Before the mid 1960’s, everything came in glass bottles or jars or tin cans. Plastic was still a product of the future and recycling was non existent. In coastal areas and islands, trash collection was also something that would not begin until the area developed. Back before the 1960's, coastal residents would bury their trash in the sand or simply toss it in the ocean (thinking the sea was this vast indestructible entity). Today we know and act differently. With the advent of recycling and the wide use of plastic for beverages, sea glass is becoming increasingly harder to find. It can take 7-10 years in a constant surf environment for sea glass to "become" sea glass. A quality piece of sea glass has no shiny spots, is well frosted (see Frost In Sea Glass Glossary) and has smooth tactile edges. The sources for sea glass are finite. Older colors of sea glass like blues, reds and aqua's are becoming smaller and smaller as they continue to age and break down. Called many things, sea glass, beach glass, mermaids tears, ocean glass, trash glass, it is all beautiful and fun to collect. Glass from the ocean is called sea glass. 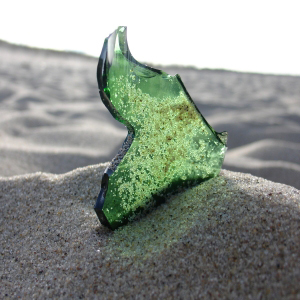 Glass from fresh water sources is called Beach Glass. Sea glass is collected the world over. It truly resembles a gem and cannot be reproduced by artificial means. The frost and pitting of Genuine Sea Glass is how you tell it was made by nature. Artifical or man made sea glass seldom has the qualities or real, natural or genuine sea glass. By The Sea Jewelry uses only Genuine Sea Glass that we certify to include the most in depth assessment of each sea glass pieces value and rarity and location found. REAL AUTHENTIC GENUINE SEA GLASS! Wherever you find people and water you will more than likely find these sea glass gems! Walking along the shoreline, beach combing look among the pebbles, shells and other flotsam. This is where you can find these lovely frosted beach jewels. 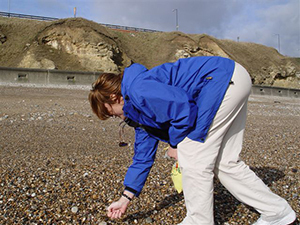 Beach Glass can be found on rivers, ocean shorelines and bays. The more current or wave action, the more likely that you are to find smooth top quality sea glass. Our collections include sea glass from The Outer Banks of North Carolina, Puerto Rico, Seaham England, Maine, Massachusetts Canada and Hawaii. We have sea glass from just about every continent of the world. Each beach can be totally different so ask around. We have found that 2 - 3 days after an onshore strong wind was a good time on the Outer Banks. Waves pushed up pebbles and shells and as their force lessened, large pebble beds yielded sea glass. If you are visiting or new to an area, ask the locals on the beach, many will be happy to help you. 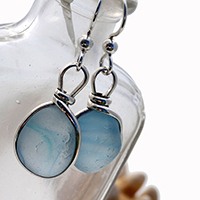 Sea Glass Lovers - Join Our 10,000 Members Today! SGL members is the LARGEST Online Sea Glass Community in the world where you can share Beach Locations, over 50,000 Sea Glass Photos, Display Ideas, Craft Ideas, Shard Identification, Online Chat and more! This is a private Member ONLY community on the Ning network that is FREE to join! If you LOVE sea glass, you'll be glass you did! Or Visit Our Sea Glass Blog at http://genuineseaglass.blogspot.com/ for weekly articles on sea glass collecting, sea glass jewelry, collecting locations and much MORE! Sea glass comes in many many shapes and sizes. There are many different kinds of Sea Glass from "Rounds" (the bottom of bottles) to patterned glass or embossed that still retails some of it's original origin (Glass imprinted with name brands patterns etc.) to one of my favorites, campfire glass (glass that has been melted in a fire and then worn smooth by the ocean). There are Bubbles (perfectly round pieces), boulders (huge lumps of sea glass), Tops (tops of bottles sometimes found intact) and many more including but not limited to. Stoppers - From Apothecary Bottles and 57 Steak Sauce. Any glass product that has EVER been made by man, is a potential source for sea glass. 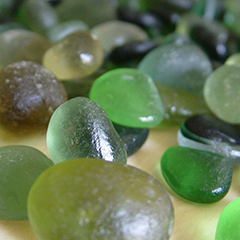 For more information on sea glass terminology and other sea glass types, see our Sea Glass Glossary Page. USE COUPON CODE "GENUINE" at checkout and receive 15% off any Seas Glass Jewelry order! PLEASE NOTE - Sorry, By The Sea Jewelry does NOT provide sea glass appraisals or certification to third parties due to time limitations.